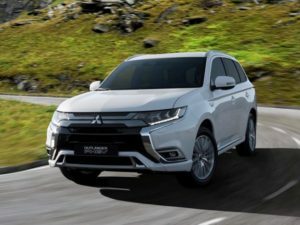 Mitsubishi has upgraded the petrol engine, electric motors and battery in the Outlander PHEV, offering more performance, increased fuel economy and a longer electric range. Set to be unveiled at the Geneva Motor Show in March, it’s the first major update for the drivetrain fitted to Europe’s best-selling plug-in hybrid since it launched in 2013. Mitsubishi has sold 100,000 in the region, of which more than a third (34,108) have come to the UK. The biggest change is a new petrol engine. Launch models used a 2.0-litre Otto cycle engine, the most common combustion type for petrol engines, but the newcomer moves to a 2.4-litre Atkinson cycle unit, similar to the technology used by Toyota’s hybrids. This is said to offer improved torque, more refinement and better fuel economy than the engine it replaces. Mitsubishi has also upgraded the electric drivetrain; the battery now offers a 13.8kWh capacity instead of 12.0kWh, while the front and rear motors have had a 10% power boost. These are linked to new Sport and Snow driving modes. The 2019 model year Outlander PHEV is marked out by mild exterior changes to the headlights, foglights and grille, as well as new wheels and a larger rear spoiler. Inside, it features quilted leather and reshaped seats, changes to the switchgear and a new instrument panel. Sales will begin at the end of the year.